Wave 2 Wi-Fi (Wi-Fi 5) is the high-performance technology for data-intensive applications in professional environments. In healthcare and for public authorities, high-performance Wi-Fi is an important success factor for efficient processes. Employees benefit from rapid data transfer and reliable networking across multiple rooms. Multi-user MIMO allows all of the available streams to be used by several clients concurrently. With guests strictly isolated from your corporate network, you stay secure while providing external users with the best possible Wi-Fi experience. Benefit from quality “Made in Germany”. The LANCOM LN-860 features two Wi-Fi radio modules, one offering IEEE 802.11ac Wave 2 (Wi-Fi 5)and the other offering IEEE 802.11n (Wi-Fi 4). This provides fast Wi-Fi to 11n-clients in the 2.4-GHz frequency band and also the growing number of modern 11ac-enabled devices in the 5-GHz band. Multi-User MIMO (MU-MIMO for short) simultaneously distributes all of the available spatial streams of the LANCOM LN-860 between several different Wave 2 clients, rather than one after the other as was formerly the case. The available bandwidth is used more efficiently and delays in the wireless network are substantially reduced. The LANCOM LN-860 uses beamforming to actively steer the signal to the clients and minimize interfering radio signals for other clients. In combination with MU-MIMO, the clients receive dedicated spatial streams with a minimum of interference, which positively influences the data rates for all of the clients. Increasing the channel width from 80 to 160 MHz doubles the performance for Wave 2 clients. By optimizing the use of the radio spectrum, a client can be supplied with a data rate of up to 867 Mbps. The LANCOM L-860 supports the WLAN optimization feature LANCOM Active Radio Control. This intelligent combination of innovative features included with the LCOS operating system—such as Band Steering, Adaptive Noise Immunity, Adaptive RF Optimization, Airtime Fairness and Client Steering—sustainably increases WLAN performance and supports administrators with professional tools for WLAN management. The Spectral Scan function enables the LANCOM LN-860 to search its radio field for interference sources, so providing a professional tool for efficient WLAN troubleshooting. By scanning the entire frequency spectrum, sources of interference in the radio field can be identified and displayed graphically. 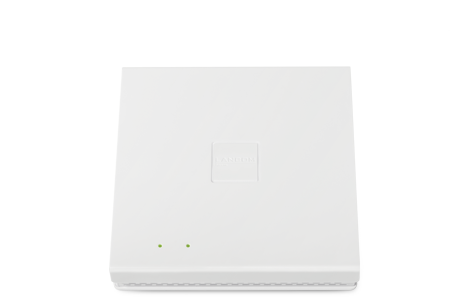 With numerous integrated security features, such as IEEE 802.1X, this enterprise-class access point provides optimal security for networks. Administrators and employees alike benefit from professional security policies on the network. The LANCOM LN-860 can be versatilely operated: Managed via the LANCOM Management Cloud it is integrated into a comprehensive, automized network orchestration, based on Software-defined Networking technology. It can also be operated via a LANCOM WLAN controller or be applied in stand-alone oparation. Knowing what the bandwidth in your network is actually being used for can be crucial in any industry. Layer-7 application detection gives you a completely transparent overview. This means that the user-friendly LANCOM Management Cloud delivers clear and professional insight into exactly which applications (such as YouTube, Netflix, etc.) are operating anywhere on the network—true added value for all-round network monitoring. The white LANCOM LN-860 has a fascinating, puristic elegance. Its modern design is ideal for unobtrusive operation in any industry as it blends seamlessly into any environment.